Social media marketing is a great way to promote your business online, however I am sure you know as well how much time and effort is behind a good strategy. With the stress of creating content, posting that content at the exactly right time every day, building a loyal audience that genuinely enjoys said content, and measuring out analytics to help fuel growth – it can easily get too much. Content creation is king right now in the digital sphere. And for good reason. Content marketing nearly triples the amount of leads your business generates, when compared with traditional outbound marketing efforts. But, all of that work doesn’t come without a price. A study back in 2015 found that approximately 80% of digital marketers felt “overloaded and understaffed” in the office. There’s no mystery of why that is. With all of the tasks you have to get done to keep those social media accounts alive, the stress can definitely add up. That’s why we want to make your life a ton easier. Down below, we’ve brought together some of our favorite tools for content creation, scheduling, engagement, and monitoring of your social media accounts. Take a break from all that posting and check them out! Now, as we hinted on above, content creation is the #1 job of digital marketers in today’s world. Back in 1984, the average number of ads seen per person per day was 2,000. Fast forward to 2014 and that number had over doubled to 5,000 per person per day. Feedly – Do you want to freshen up your regular posts with some interesting industry articles? Then Feedly is a great tool to help you find relevant content or inspire you for your own content creation. Canva – The premiere image creation tool, Canva will make your content creation tasks easier than ever! Simply select from any free (or paid) template on their website based on what social campaign you’re conducting, drag/drop/edit to your heart’s content, and you’ll have the images you need. Rocketium – Similar to Canva, Rocketium lets you take your video creation to the next level. If you just need to create short videos with simple texts (think Buzzfeed! ), this is a tool you’ve gotta try out. Besides creating content itself for your social media accounts, the actual posting can take so much time from your day. Double or triple that time if you’re posting twice or three times per day! 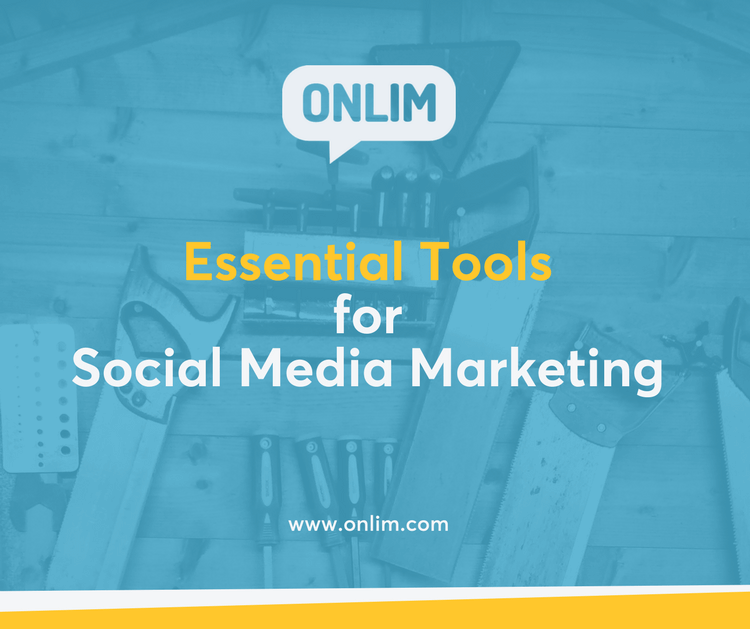 Onlim – Hey, you can’t blame us for putting ourselves at the top of the list, can you? With Onlim you will have a great calendar to keep an overview of your published and planned posts. And it’s very easy to schedule new posts or curate content from others (our News-Feed feature is similar to Feedly, but we offer the all-in-one version 😉) . Later – Looking for a tool to plan posts for Instagram? With Later, one of the premiere scheduling softwares for Instagram, you can schedule out as many posts as you want. Most of them are scams! You’ll either get hundreds of bots following you or have your entire account stolen from you. Kickstagram – The team over at Kickstagram will work with you to develop a growth campaign that works for your target audience. With their help, you can gain hundreds of real, organic followers on Instagram every day! The Chrons – If you want an all-in-one Instagram solution, these guys have got your back. Any one of their social media experts will help you grow an engaged and loyal following that genuinely enjoys the content you’re putting out. Crowdfire – Crowdfire is also an all-in-one app but for several platforms. You can connect various social media accounts, cross -post very easily and manage followers & unfollowers on Twitter. And lastly (and we know any marketer will love this one! ), we have analytics. Measuring the growth and performance of your social accounts is a must if you ever wish to grow past those measly 1K followers you have. Facebook Insights – We just have to mention this, as Facebook Insights are great for small business to get started! You have all engagement metrics and can learn a lot about your audience in the Audience Insights. Keyhole – Next up on the list is Keyhole, a hashtag-monitoring tool for Instagram and Twitter. Just input a handle or hashtag and you will have real-time analytics right in front of your eyes. Sprout Social – Looking for even more analytics? Sprout Social is a tool that gives you the data you need to increase social engagement. Not only that, but it also doubles as a social scheduler. For brands and larger businesses, that’s a jack-of-all-trades right there! With the right social media tools on your side, you can finally breathe again and stop stressing. Pick out the ones that work for you from the above list – and let us know if you have any questions!